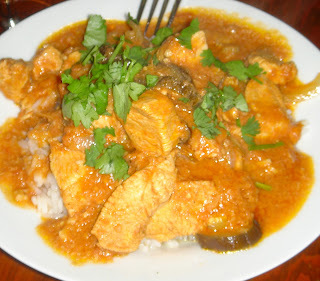 This weekend I had my first taste of Indian food. Even better – it was home cooking! This was certainly an experience I didn’t anticipate coming to Korea. But, the expat community here is diverse. So yes, this was the first meal I have ever shared with Indians, Koreans, South Africans and Americans. And, it was fantastic…the food and especially the conversation. I’m impressed by some people’s ability to find community. At a church I’ve just started to attend, a new family has arrived. Their second week here – they were inviting perfect strangers into their home for lunch. Did we like Indian food? Well…we would find out that yes, both my husband and I like Indian food and homemade Chai tea. I continue to discover that people from all over the world are the same in so many ways. We all want community and friendship. We all know this can be found by sharing a meal together. We all love to laugh and share a joke. And, we are all curious about each other. Navam and his wife Joyti were happy to share bits of their culture with us, and it was all an education for me. It was also interesting to hear our perceptions about each other. I’ll just examine one for a moment. To hear from them, that Americans are perceived as very prim and proper was certainly a surprise. In contrast, they described themselves as very informal. In some ways I can now understand that perception. These new friends were inviting us all over any time…stay the night…take a bubble bath in their luxurious tub…eat their food…stop by anytime. Please do, they insisted! "I’m Lovin’ It"….isn’t that the cheesy McDonald’s jingle? Well, I can tell you I love McDonald's with a passion I’ve never felt before. McDonald's half way around the world is so much more special! The truth is it’s not the food. Although the fries are still a fattening, uber-delicious and crispy treat. It’s the familiarity. In a world where everything is strange and signs are indecipherable, the golden arches are a beacon of light. I know what’s inside, and I can even figure out how to order the food. The employees may not speak much English…but “Number 6,” “Nuggets,” and “Coke” are universal. Yes, experiencing a new cuisine and trying new foods can be fun. But, sometimes I just want something I know. This is not an overly Westernized neighborhood where familiar chains are on every corner. In my neighborhood…McDonald's is it. We’ve only gone a handful of times. But, on those occasions – McDonald's saved the day. I’ll put it this way…some days familiar trumps foreign, and McDonald's fits the bill. I know I’m a relatively intelligent person. But, my confidence is wavering. Simple tasks in life are suddenly monumental in Korea. So now…how to pay this bill? 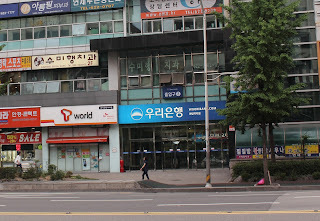 I do now have a bank account in Korea. But, they don’t do checks here. The bill doesn’t even come with a return envelope. Go online you say…nope. Either you transfer money directly from your account or you go to the bank to pay a bill. For instance, the electric company has an exclusive contract with a particular bank, so I can walk into that bank to pay my bill. Keep in mind – I’ve learned all of this bit by bit. So, this week I set out to pay my bill. Except…I forgot exactly which bank to go to. Was it KEB or KB? Let’s try KEB….nope. I showed them my bill and they gestured across the street. I stopped in my bank just to make sure, where I know some tellers speak English. They confirmed – yes, go across the street. So, now I’m at bank number 3 – the correct bank. I go to the teller, hand her my bill and passbook. She looks baffled. Yes, I’ve handed her the passbook to another bank (my bank) figuring she will use my account number to make the transfer. She’s speaking rapid fire Korean to a co-worker and I know I’ve done something wrong. Turns out – the bank will only accept cash in person. So, now I’m back at my bank. From here, I know I can make a transfer for a fee. I wanted to be smart and avoid the fee. Not so smart, I guess. But at least my bill is paid. This is what I like to call a small victory! Booking our vacation by first attempting to use Korean travel agents…you know, actually that was a BIG victory. You get the idea. Life here can be humbling, for sure. That's my bank across the street (in blue). A total of 4 stops were made to pay my electric bill. 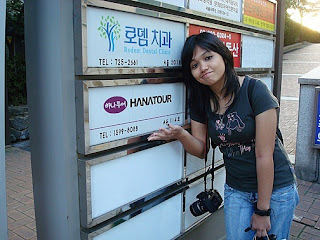 "HanaTour" means Number One or First Tour, but only if you speak Korean! In fairness, they tried to help, but after calling countless agents, we ended up going it alone. A post office box. They are all red here, as I discovered when I finally found the post office! The almost absolute absence of street signs makes naviagation difficult. Baseball may be the American pastime, but it looks a lot different in Korea. Oh, the game is played just the same. It’s the fans and the atmosphere that keeps your head on a swivel. The first thing you notice about the fans is their energy level and their capacity to make a lot of noise. The cheering never stops! An American just listening to the fans may have thought homeruns were being hit one right after the other. Each team has a “cheerleader” (for lack of a better term) who is constantly leading the fans in various chants. While I don’t understand the Korean language, some of the chants or music were recognizable – including a rally to the theme song for “Inspector Gadget.” Meanwhile, the fans are all armed with thundersticks, just to ratchet up the noise quotient. Now, inside and outside the ballpark you will see plenty of vendors selling food, but the only thing you will recognize is the bottled water. There are no peanuts, hotdogs, pizza, or popcorn. Instead, you have a selection of sushi and dried squid. You can bring your own food – and people bring fruit and sushi and dried squid. Don’t fear – beer is universal and sold here too. I found the mascots to be a bit different. On our game day, we came to cheer the home team, the Doosan Bears. Their mascot – two bears. A boy bear and a girl bear. But, these weren’t your average bears. First of all – they wore only bear heads, and then were dressed like regular people from the neck down. But, it was the dance they performed to rally the crowd that left me with my mouth agape. It wasn’t exactly child friendly. I would best describe the dance as provocative. The main moves were hip thrusts and pelvic gyrations. The finale included the boy bear down on his knees tearing his shirt open. Huh? I came out for a baseball game and I can tell you the Bears won – but I have no idea what the final score was. The action on the field became secondary – I was so taken by the atmosphere. And, I can tell you this won't be my last ballgame. This sign proclaims that the Bears are the best! The signs were passed out to all the fans. It may look similar, but the stadium was smaller than a typical US ballpark. I liked this picture of the back of the baseball jerseys. A couple of days ago, I posted "Hong Kong Surprise" to share our experience of meeting a lovely local family during our recent vacation. Since then, Chris, Alan and family have been in touch to share some wonderful photos. They did a much better job of documenting our day, so I wanted to share some more pictures here. For me, these are just priceless! This is the whole gang! Chris and Alan kindly had us over to their condo before heading to the beach. 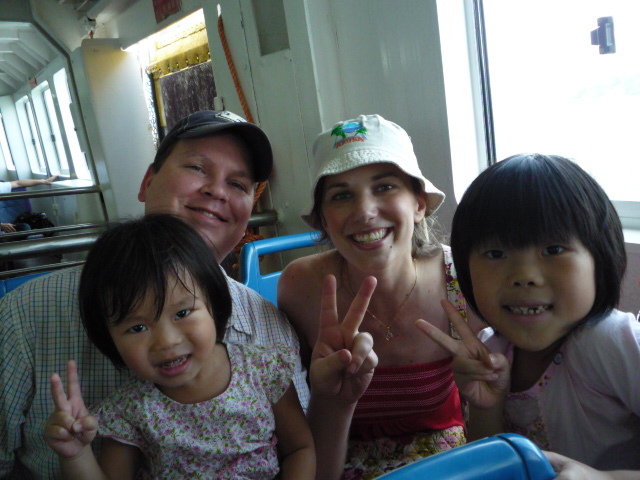 This is on the ferry to Cheung Chau Island, shortly after meeting. You can see we were fast friends! 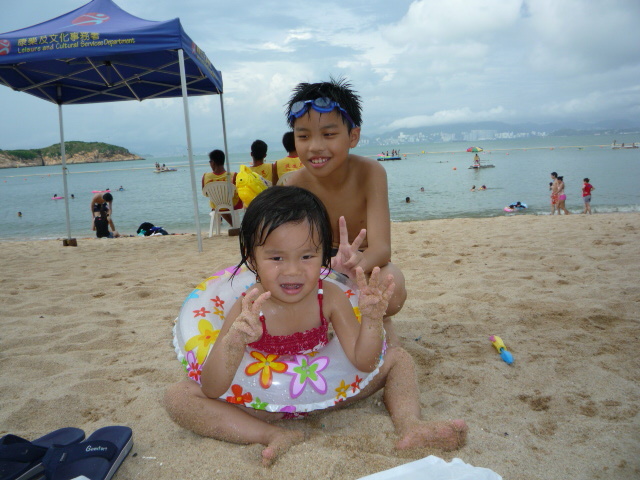 Alex and Esther on Tung Wan Beach. Playing in the South China Sea. 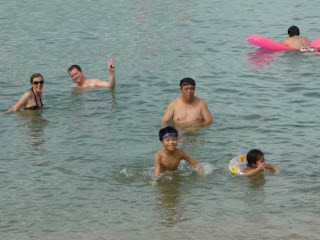 Hong Kong is very hot in July, and the water felt wonderful. I am not an adventurous eater. So moving to Korea, I knew the food would be a challenge. For me, squid is definitely a challenge. It's the texture -- chewy is not my hot button. In this video you see my not so mature reaction. I guess being a food critic is out of the question! Korea is considered one of the most homogenous countries in the world. Foreigners have only begun to infiltrate this small nation. To see anyone that isn’t Korean or Asian outside of a tourist spot is an oddity. For the first time in my life, I find that I’m the minority. It’s not an unpleasant feeling, but it is unfamiliar – to look around and know you look different. Before I arrived, I was told people would stare at me and my husband. They do – but most are discreet when they steal glances at us. It’s okay – I’m examining the faces around me too. It’s the elderly who seem to be most fascinated – they stare openly. A couple of men have grabbed my hand or arm, it seems just to touch me and issue a silent greeting. That attention is nothing compared to what my niece and nephew are experiencing in Korea. They are 7 and 3 years old and very fair – light hair and bright blue eyes. Korean people just don’t want to meet them – they want to touch them – to ruffle their hair and grab their hand. They offer candy, take pictures, and try to coax a conversation with them. They stare unabashedly. They’re utterly fascinated and tickled by their presence here. Some people are curious enough to approach us and ask where we’re from, although most guess America. They want to know why we’re here in their country. They’re not surprised to hear the answer that we’re teaching English. But, I love that curiosity. They’re happy we’re here and they’re happy to tell us about their country. Looking different has created a strange sensation – you immediately notice someone else in the crowd who’s white. Not just because of the color of their skin, but because of what it means. Here it likely means they speak English – and it’s amazing how wonderful your own language can sound. 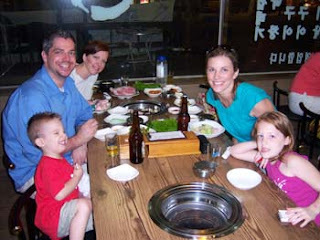 Our family having Korean BBQ together. Yes, we stand out. When you think about it – it’s just a bunch of buildings grouped together. It is steel and glass and concrete. I’m trying to come up with a logical answer to the question – what is so special about a city skyline? It may not be logical, but the Hong Kong skyline set my heart racing. I fell in love with it the first time I saw it. And, it was daylight, which says a lot. During the day the skyline was beautiful. But, at night, it was simply spectacular. It’s the setting – water is alluring. The Hong Kong skyline sits on Victoria Harbor. The water traffic alone is entertaining. You have commercial barges moving past old men in their fishing boats, transport ferries, and tour boats. In the daytime the sun sparkles on the water. At night, the neon lights from the buildings bounce off the waves. About those neon lights…who knew neon could be so beautiful! Dozens of buildings are lined in bright colors and shapes. Actually, Hong Kong is known for the “Symphony of Lights.” It has been named the “World’s Largest Permanent Light and Sound Show” by Guinness World Records. Think neon, laser beams and searchlights synchronized to music. The show is a bit cheesy and overbilled...but again, the skyline...well, it’s beautiful. So, the logical answer may elude me – but the emotions are unmistakable. A skyline is a city’s signature and it’s a symbol of the excitement and power you find at ground level. Moments after seeing the skyline for the first time! An old fishing boat on Victoria Harbor. Just one example of the interesting water traffic. Cameron and I enjoying the view from Kowloon. Photos can't do this skyline justice. The size, the scope and the colors are wonderful. My recent trip to Hong Kong with my husband was a bit last minute, yet I still crammed in my research. You must understand – I am a planner. I booked tours for the best sights, and secured our spot on a boat cruise. Within a week I had vigorously researched our hotels, the public transportation, and restaurants. I had also highlighted and underlined important points in my guidebook! I was armed with information. Yet, despite all my planning, I cannot take credit for one of our most memorable days. We started out with loose plans – we would hop on a ferry to an outlying island and relax at the beach. It was the ferry ride and some silly faces that sealed our fate. Seated just in front of us was a family from Hong Kong. One of the little girls seemed fascinated – she kept looking back to examine us. So, of course my husband decided to make goofy faces to get her giggling. After all, silly faces are a universal language! We had made a connection. 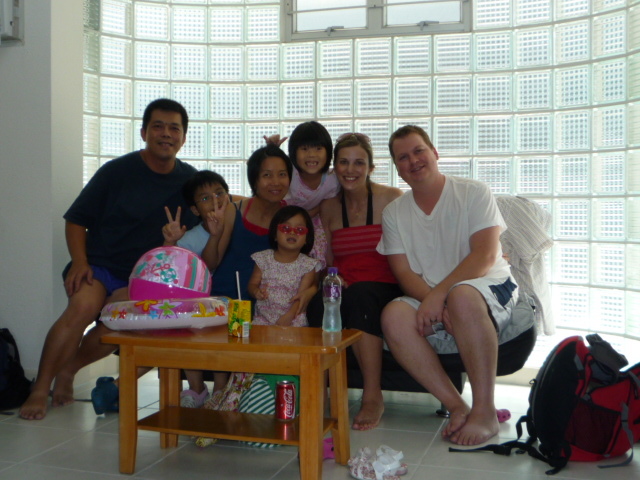 Although Cantonese was their first language, the family spoke English. Suddenly, the children were practicing their English with us and we were enjoying a pleasant conversation with their parents. I though it would just be a fleeting connection – when they invited us to spend the day with them. Alan, Chris, Alex, Gloria, and Esther; those are their English names – this family that was so warm and welcoming to us. First, they led us to a local seaside restaurant with no menus for an authentic Chinese lunch. It was delicious and they insisted on treating us. We went to their beach bungalow and took photos together. Then, we were in our swimsuits and off to the beach. As I continue to discover – children are the same everywhere. They are sweet and playful and curious. Just as we would in America – we batted around a beach ball in the water and made castles in the sand. The day ended too soon. We had a boat to catch and our new friends were staying for the weekend. This day was full of simple pleasures and I will never forget it. The opportunity to engage in a relationship with people from another culture is wonderful. The mother, Chris, kept thanking us – saying this was a wonderful experience for her children. It was the first time any of them had truly engaged with foreigners. Eight-year-old Gloria told me she was happy we were with them. All I can say is….me too, me too. Here, 12-year-old Alex and 8-year-old Gloria play in the South China Sea. We spent the day at Tung Wan Beach on Cheung Chau Island. 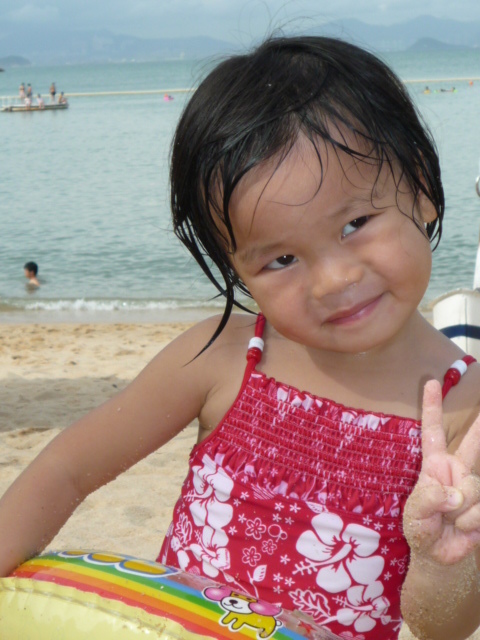 4-year-old Esther got distracted right before I snapped this photo -- but I still caught her posing with a peace sign!